My walkie-talkie squeaked out: “Mourning Warbler on the left!” Everyone jumped out of their cars and hurried to the edge of trees between the gravel road and the shrubby field. The plain, little olive-backed bird with a mourning hood sang to us for the next 30 minutes. When he sang, we tried to get our binoculars on him; then we saw a flash of yellow as he moved to a different shrub. We followed him up and then down the tree line. Another, even more sulky bird was spotted for a moment before it went deep into the thick underbrush. We guessed that it was the female and that the male was trying to draw us away from the nest. Most of us got to see the beautiful male Mourning Warbler – a rare “gem” of the east. For some it was like putting a puzzle together in order to “see” the entire bird: first a peek at the gray head, then a look at the black breast patch, then a splash of yellow belly…put it all together and you have a life bird!! 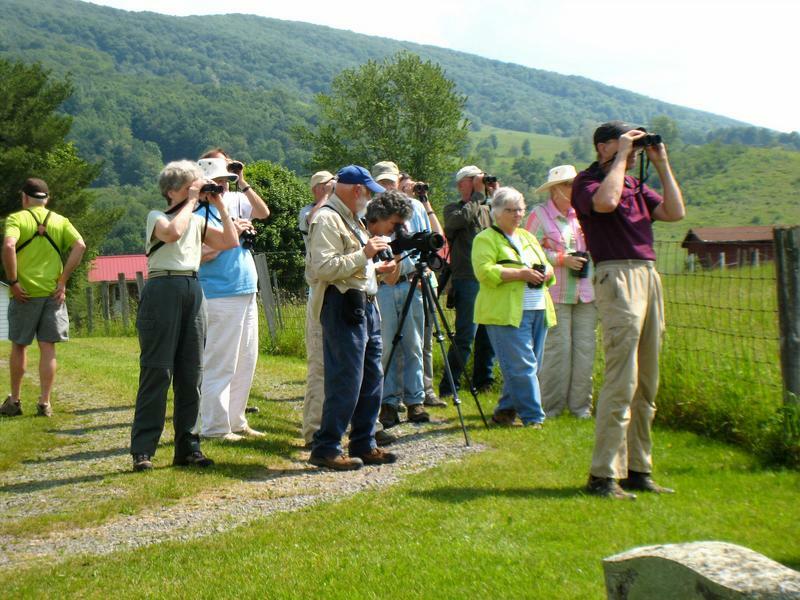 Paddy Knob had produced its rare “target” bird for the 24 birders of Forsyth Audubon! The bugs that the Mourning Warblers enjoy were annoying, to say the least. The “hands above the head” trick really worked! Bugs fly to the highest point…who knew! Photo by David Shuford. 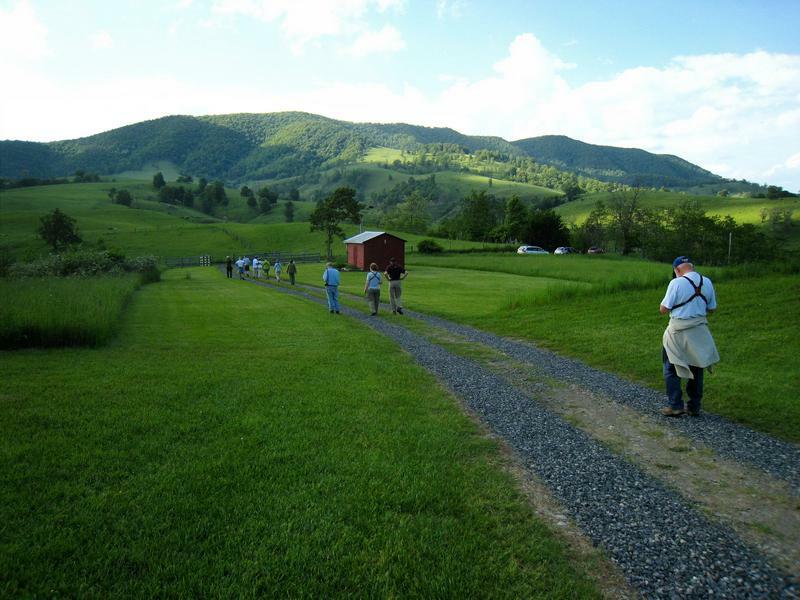 The Forsyth Audubon 2015 Spring Trip to Virginia had begun the day before on Friday, May 29, 2015. Most of us had to get up before the birds so that by 6 AM we would be embarking on the 3-hour trip north to Peaks of Otter on the Blue Ridge Parkway in Virginia. A few fortunate others slept in a bit since they had spent the night at the Peaks of Otter Inn… just across the street from our meeting place. They enjoyed a leisurely morning of breakfast and birding around the beautiful Peaks of Otter grounds until the rest of us arrived. It was a beautiful morning at Peaks of Otter and it would prove to be a great day to be birding in Virginia! Once all arrived, we headed up the parkway to Sunset Fields. A quick survey produced Ovenbirds, Scarlet Tanagers, and Hooded Warblers. Many American Redstarts were singing in the area as well. Group one headed down Warbler Road, with the second group starting shortly after. 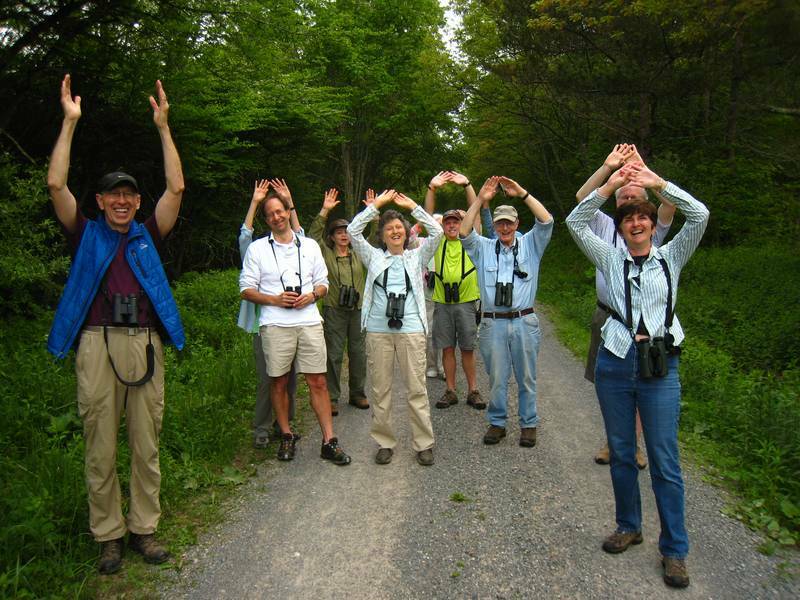 In less than a mile, both groups were enjoying sightings of Cerulean Warblers. Many people were happy to count this beautiful blue “gem” as a life bird. As we continued down in elevation, the habitat changed slowly. Now, the calls of Acadian Flycatchers and Worm-eating Warblers echoed through the oaks and pines. A very fussy Black-and-white Warbler pair warned us that we were too close to their nest on the ground. Mr. B&W, beak full of bugs, walked down a tree to his nest on the ground. We saw where he disappeared but we tried without success to find the nest! It had to be right there, but it was hidden too well by this feathered pair! Northern Parulas and Louisiana Waterthrushes entertained us during our lunch break near North Creek Campground. 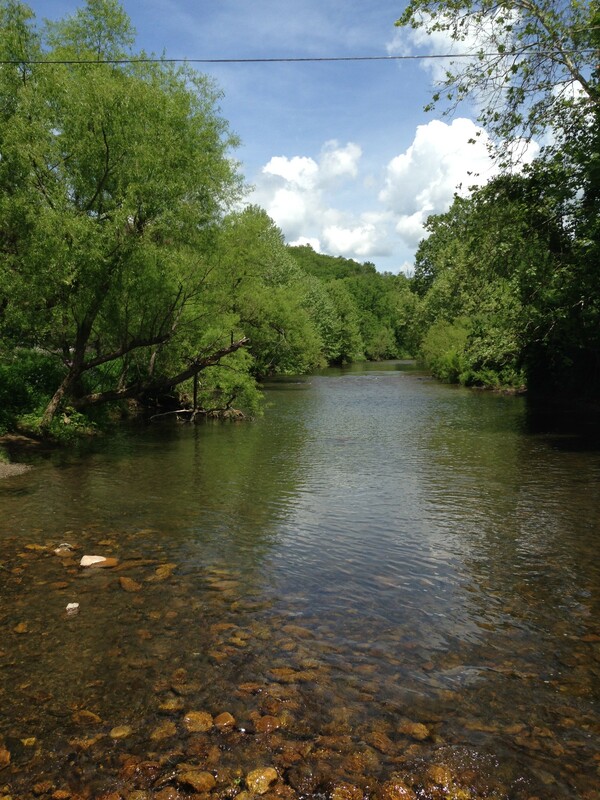 We could have spent all day on Warbler Road, but after lunch we drove to our accommodations in Warm Springs, VA.
At Hidden Valley, Don Lendle spotted a third year Bald Eagle soaring in the sky above. The eagle was not alone: A broad-winged Hawk and two Ospreys were harassing him! Each time the Broad-winged attacked, the eagle did a complete barrel-roll with talons glinting right at the attacker! Then the Ospreys joined the attacks. The eagle simply rolled on his back, seeming to float – feet up – holding for a second before completing the roll. We were thrilled by the show. It was definitely one of the highlights of the trip! Our destination on the morning of Day 2 was Paddy Knob. In our high hopes of seeing the Mourning Warbler, we listened to his song on our iPhones so that we would be ready. It was a one-hour drive to the north-west, up Route 220 with a left on 84, then onto WV 55. The forest road that leads to Paddy Knob follows the border between Virginia and West Virginia. The lush woods along WV 55 were filled with the chorus of Least Flycatchers, Veeries, Black-throated Green Warblers, and Black-capped Chickadees! Then the Mourning Warbler’s solo “Chirry, chirry, chirry, chorry, chorry” joined in the music of the forest just as we reached Paddy Knob!! After enjoying some time with the Mourning Warbler, our group split up and explored the 3.5 mile road back down to Route 84, before heading to Monterey for lunch. High in the leafy branches along WV 55, we had a final, special sighting: a male and female Blackburnian Warbler! 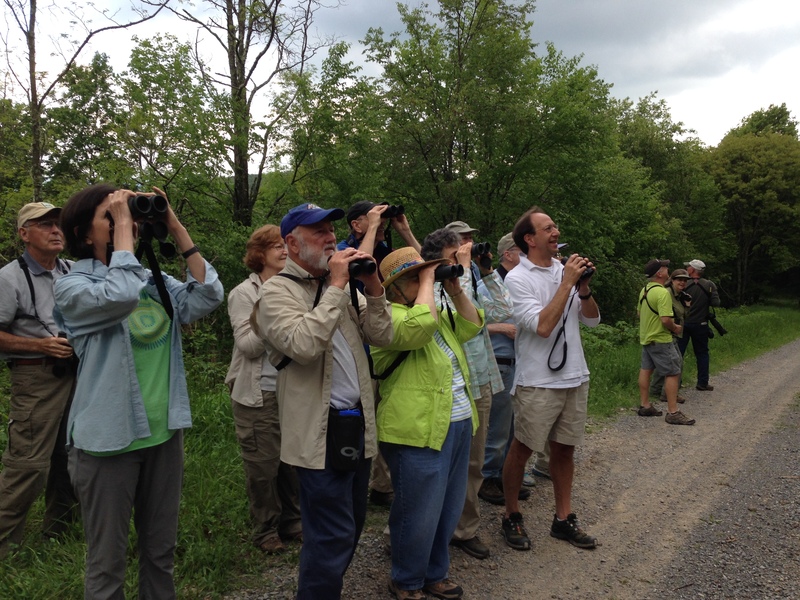 It is not often that Southern birders get to enjoy a Black-capped Chickadee! In the afternoon, we stopped at the cemetery in Blue Grass where we added Bobolink to our list. This quiet hill provided a high spot from which we saw soaring vultures, Red-winged Blackbirds, Eastern Meadowlarks, and of course the Bobolinks. Birding at the Blue Grass Cemetery. Photo by David Shuford. For our last stop of the day, we explored the road along Margaret O’Bryan’s property where Rob Rogers helped us spot a Golden-winged Warbler. Around that same time, Mr. and Mrs. O’Bryan drove up the road!! They graciously invited us to bird on their gorgeous property! 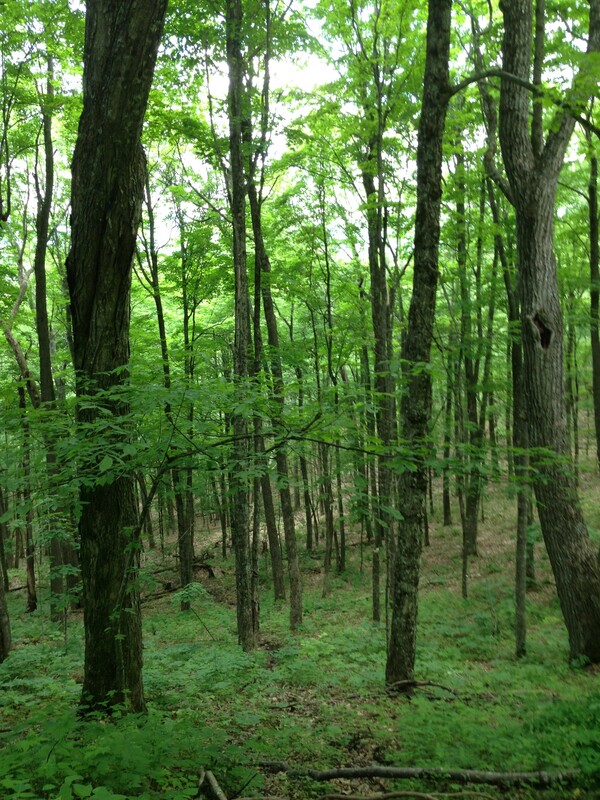 We could hear Golden-winged Warblers singing in the distance as we walked along their mowed paths…keeping a look-out for slithering reptiles (of which we had been warned). The view from the O’Bryans as we headed back to our cars! Photo by David Shuford. As the sun lowered in the sky, we unanimously decided to call it a day. A final bird, a Red-headed Woodpecker, made a brief appearance, putting an exclamation mark at the end of this great day in the Virginia Highlands! 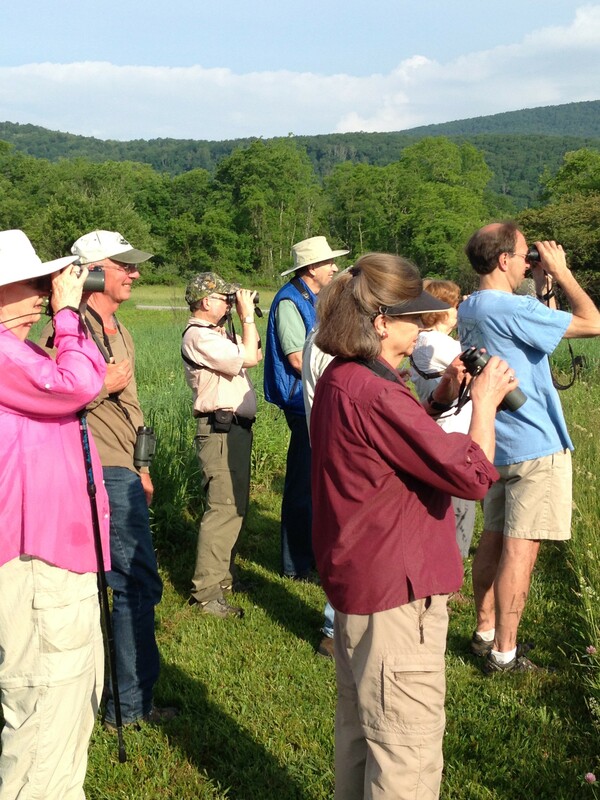 Many of us started the day on Sunday with one more birding trip to Hidden Valley!! Others enjoyed a leisurely breakfast at the Warm Springs Inn before heading back to Winston-Salem. The most interesting find that morning, thanks to David Shuford’s sharp ears, was a probable Blue-winged x Golden-winged Warbler hybrid! It was singing the Blue-winged Warbler song; then it switched to a form of the Golden-winged Warbler song. Rob Rogers, the only one to get his binoculars on it, was pretty sure he saw dark on the throat which would make it a Lawrence’s Warbler – much less common than the Brewster’s hybrid between the two species. It was the “one that got away;” the one that draws us back into the field tomorrow… to bird again. Two more warblers would make it to the list before we pulled out of the parking lot at noon: a Yellow-throated Warbler and a Yellow-breasted Chat. The final count for the trip was 97 species! Amazing! I want to close this report with a huge thank you to each of these people who joined in on this trip sharing their expertise, help, and encouragement: Rob Rogers, Phil Dickinson, Bill Gifford, Nancy Russo, Lucia Zinzow, Bill and Betty Gray Davis, Allen and Jeanine Elster, Tommie Castleman, Fran Shelton, Bob and Katie Dalton, Warren Jones, David Shuford, John and Trish Shoemaker, Bill Jackson, Carol and Ouida Cunningham, Don Lendle, Anne Stupka, and Kathy Donaldson. Birding image is everything! 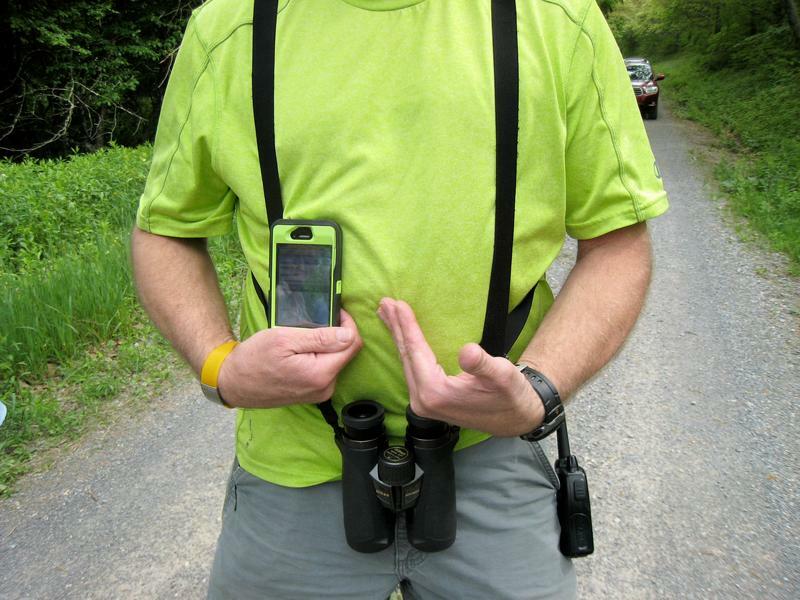 : Binoculars with comfy back strap; waterproof watch; walkie-talkie; and color-coordinated shirt and iphone cover! Photo of Rob Rogers by David Shuford.